Today at Apple’s new Steve Jobs Theatre, Apple announced its new Apple Watch, called the Series 3. This is a new model above the Series 2 announced last year, with the new headline feature being LTE support through an integrated modem, which we believe to be an Intel modem according to trusted analysts. iFixit has done a teardown and confirmed a Qualcomm modem in their unit. We are in the process of confirming if this modem is in all Watch 3 or if it is dual sourced. 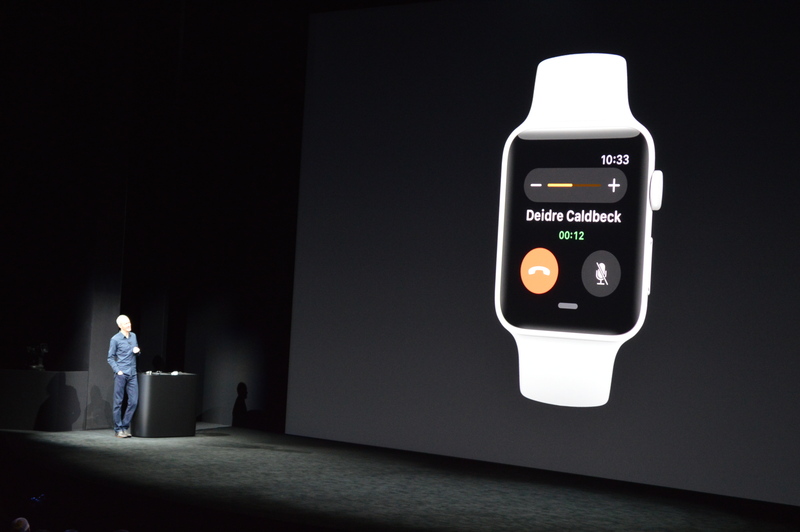 With other watch makers having had LTE models, it had been one of the missing features with the Watch Series 2. Now Apple is making that leap, supporting both LTE and UTMS by using the display as the antenna, rather than internal antennas that might take up extra space. Rather than use a regular SIM, Apple is implementing an eSIM to save on size, which was demonstrated on AT&T during the presentation. To that end, Apple stated that the Watch Series 3 is only 0.25mm wider than the Watch Series 2 on the rear crystal, with all other dimensions the same. With LTE, Apple states that users can use features such as Maps, take calls, and stream Apple music. 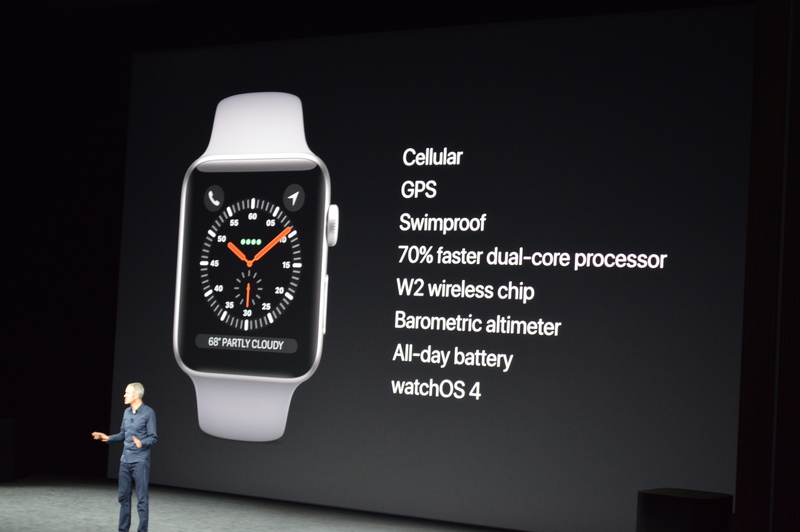 At the heart of the Watch Series 3 is a new processor – moving up to a dual core version over the Series 2. Apple gave very little information on the processor, except that it offers 70% more performance over the Series 2 but stays at the same size. No details on the cores inside, or the node, but with the new LTE add-in, Apple is quoting the same 18 hours of battery life with a mix of LTE, WiFi and screen-off use during that time. Also in the hardware is a new wireless chip, called the W2. Again Apple was light on details, except to say that it offers 85% faster WiFi combined with a 50% higher efficiency. On the health side, there is a new barometric altimeter, for calculating air pressure and detecting going up stairs. For software, Apple is going to launch WatchOS4 on September 19th , which will ship on the new Watch Series 3. This update will bring the heart rate detection to now display directly on the display, with an enhanced heart-rate detection mechanism that will provide resting heart rate data, calculated based on continuous data over several days. 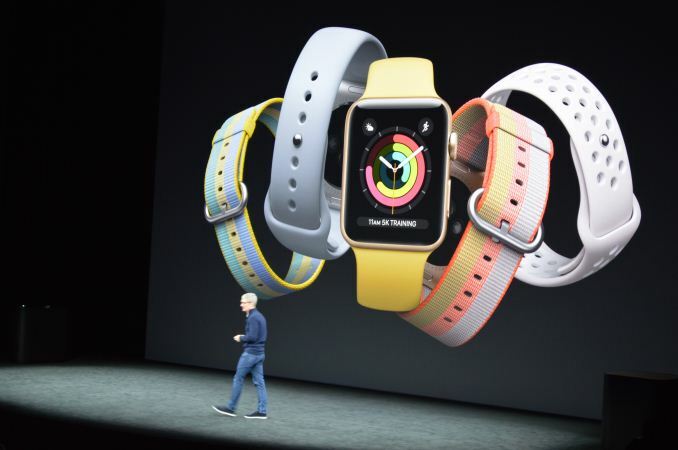 Apple will also add in notifications for users that might experience abnormal heart rates when exercise is not detected. This will be in conjunction with Apple’s new Heart Study, which will use Watch data to analyse arrhythmia in a collaboration with Stanford Medical and the FDA. The first phase of this Heart Study will be available to download in the US early next year. 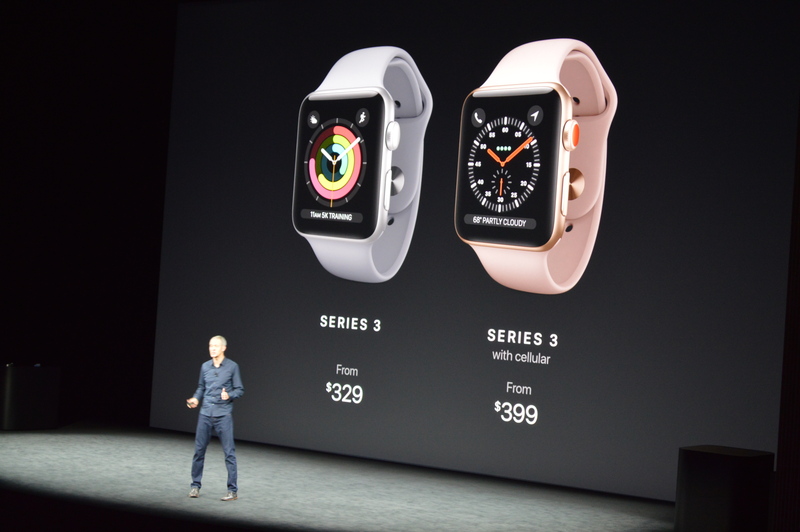 For prices, Apple gave the base Watch Series 3 as $329, but in order to have the LTE version the price increases to $399. It looks like Apple will be discontinuing the Series 2 as it was not mentioned, but the Series 1 model will still be available at $249. Orders will begin on September 15th, with availability on the 22nd. 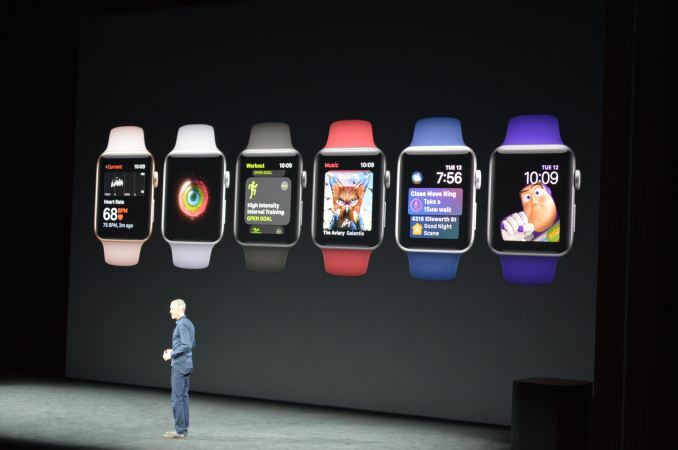 During the presentation, Apple stated that the Apple Watch is now the #1 watch brand worldwide, up from #2 in 2016, supplanting Rolex. This is on the back of a 50% year-on-year growth in Apple Watch sales, with Apple citing a 97% customer satisfaction rate. Apple did not disclose the exact number of unit sales, due to bundling the numbers in with other products, and so did not disclose if the 50% YoY was on unit sales or overall revenue from accessory or app sales. If it works with T-Mobile, you could likely activate it with an MVNO like Ting for $6/month. It would share the data with your existing plan. Unfortunately, Ting is not very competitive on data (it's about $10/GB) but the initial costs are VERY low. I have four lines with Ting, but combined all of them only use around 4GB of data (one is simply for my car to receive realtime traffic, weather, google maps, remote start, etc, at about 100MB/month) and my monthly total for all four lines with 1000 minutes 3000 texts is $77 after taxes.